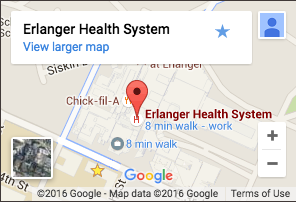 Children’s Hospital at Erlanger, one of four Comprehensive Regional Pediatric Centers in the state of Tennessee, provides the highest level of care with immediate access to state-of-the-art equipment and a staff of pediatric subspecialists— important advantages for the children of our region. Children's Hospital is a full-service facility with a designated Level IV Neonatal Intensive Care Unit, providing the very highest level of care for premature or sick newborns. The Pediatric Trauma Team, Emergency Department, and Pediatric Intensive Care Unit provide immediate, 24-hour-a-day care for critically ill or injured children. Erlanger LifeForce Air Ambulance and the Neonatal/Pediatric Ground Transport make the services of Children's Hospital quickly accessible to pediatric patients throughout our region. No other facility in our region offers these services.